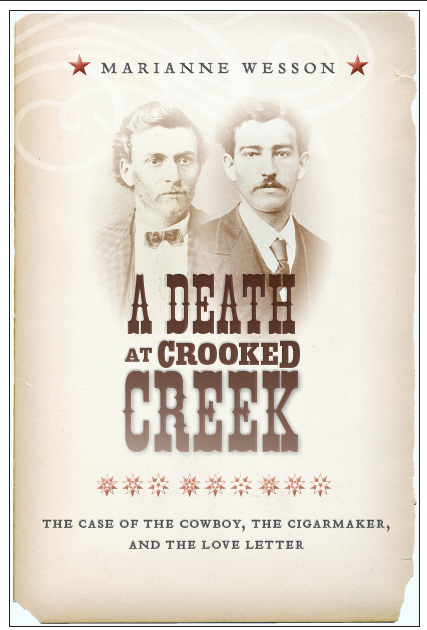 Wesson’s research into the Hillmon case– its history, its characters, and its lasting consequence– animates her book A DEATH AT CROOKED CREEK: THE CASE OF THE COWBOY, THE CIGARMAKER, AND THE LOVE LETTER, published in 2013 by New York University Press. You can order a copy of the book, if you wish, here or here. It’s not yet eight in the morning, but even so heat rises in shimmering waves from the grass-carpeted floor of the graveyard. The earlier months of this spring brought drenching rains to eastern Kansas, and the saturated green of the cemetery hurts my drought-accustomed Colorado eyes. The neon color scheme extends to a coffin-sized rectangular outline of Day-Glo orange that glistens on the grass amid a jumble of old headstones. The grave that interests us has no stone or monument, but Mitch Young, the cemetery supervisor, has marked its boundaries with spray paint. Even after all these years, he is confident that their records allow him to identify its location with precision. I have seen the entry: John W. Hillman, 04/05/1879, grave number 555, lot ID 0000421. The spelling is wrong—it’s Hillmon—but the rest of the name and the date are correct. This is the place, all right. Mitch sits in the cab of his backhoe, and everyone else stands gathered a few yards away, expectant—anthropologist Dennis Van Gerven and his graduate student Paul Sandberg, my husband, Ben Herr, Ernesto Acevedo-Munoz and his documentary film crew, a small crowd of journalists kept mercilessly at bay by the city’s communication officer. They’re waiting for me to give the signal to begin, and any further delay would be pointless: it has taken us more than a year and considerable trouble to achieve permission to disinter the body below the ground, and we’re not going home until we do. I know, moreover, that we are not the first to disturb the dead man’s repose. Even so, the ancient prohibition against violating a final resting place pushes back with surprising force against my determined intentions. I mumble a few awkward words in the direction of the ground—something about apologizing to the man below for the intrusion, and thanking him for what he will allow us to learn—but they do not vanquish the dread, which will remain with me all day. I nod to Mitch and he fires up the backhoe’s engine, maneuvers its corrugated iron teeth into the ground, and begins to strip off the top layer of earth between the orange boundaries. The raw turned soil beneath the blade sends up a bracing scent of minerals mingled with decay. Dennis, my partner in this venture, is a colleague at the University, a physical anthropologist—an unlikely Indiana Jones, short and bald, but dashing and unflappable nevertheless. He consorts habitually with dead people; I do not. I believe in cremation and memorial services and avoid funerals. Dennis, on the other hand, has made a name for himself with his research on mummies. As a matter of professional necessity, he regards the dead as reasonably good company. I am of course familiar with the rumors about curses and the like, so I imagine he’s had to develop a matter-of-fact attitude toward his work. I recruited him to this investigation even before I realized it would entail digging a body out of the ground, but as matters have turned out I am very grateful for the participation of someone who has done this sort of thing before. I appreciate his calm and his experience, because as far as I am concerned this situation, despite the brightness of the day and the clutch of onlookers and crew, invites the presence of irrational anxieties and the occasional apparition. Sallie Hillmon, for example, John’s wife—she’s haunted my thinking for many months now, and it would not be at all difficult for me to believe that I’ve caught a glimpse of her, wearing a long calico dress, over there in the shade beneath a stand of oak trees. I know she stood near here once, in 1879, the first time they put the body into this grave that Mitch is now busy uncovering. I’ve learned quite a bit about her, actually, and as for the rest, I find it dangerously easy to imagine. Sometimes the things I’ve discovered and those I imagine collude to persuade me that I know her, that I understand her as well as I do my friends and colleagues. I appreciate that this is an illusion, but it is at certain moments an irresistible one. There is of course one thing that I don’t know about Sallie: What was she thinking when she looked on the body that we will disinter today? “Oh my dear, I will miss you so very much”? Or perhaps more like “Dear God, I hope we get away with this”? That is, did she recognize her husband immediately, as she would claim in every public forum? Or did she gaze on a corpse that she knew was not John Hillmon’s but another’s, as the insurance companies would later maintain? Or was she perhaps in doubt, confounded by the changes the corpse had gone through during the month since life had left it? I cannot be sure; I can only hope that what we learn from Dennis’s examination will bring us closer to knowing. This uncertainty, however, does not seem greatly to impede my imagination. I press my back against the trunk of a massive oak and watch the backhoe tear up the thick grass, trying to calm my unruly pulse by reflecting on the events that have brought me here. Some of them happened quite a long time ago. The Hillmon lawsuit arose out of a dispute concerning the identity of a corpse, and its macabre subject matter had brought the case a great deal of attention even before the nation’s highest court agreed to hear it. The suit was one for enforcement of a contract of life insurance: Sallie Hillmon, a young woman of Lawrence, Kansas, claimed that her husband, John, had been killed, in the late winter of 1879, by a firearm accident at a desolate campsite in western Kansas called Crooked Creek. The three insurance companies that had issued policies on John Hillmon’s life disputed the claim, maintaining that Hillmon was still alive, so in 1880 Sallie sued the companies for the policy proceeds. The case had been tried three times before reaching the Supreme Court; the first two trials ended in hung juries, but the third had produced a verdict for Sallie Hillmon. Frederick Adolph Walters’s letter, in which he said more or less “I plan to travel out west with John Hillmon,” was undeniably hearsay, as it was offered in evidence to prove that the cigarmaker had this intention (and hence that he carried it out, which in turn would contribute to the likelihood that it was he rather than John Hillmon who died at the Crooked Creek campground). Judge Shiras’s ruling excluding the letter thus seems in retrospect clearly correct, indeed unavoidable. The more surprising circumstance is that Sallie Hillmon’s lawyers did not make the hearsay objection at either of the first two trials, the ones that ended in hung juries; it seems not to have occurred to them until the third. The law did recognize various exceptions to the hearsay rule at the time the Hillmon case was tried. These exceptions could operate to make an out-of-court statement admissible even if it was put forward, as lawyers say, “to prove the truth of the matter asserted.” Most of the hearsay exceptions were designed to accommodate evidence of statements made outside of court when there were reasons to believe they were true and reliable. Dying declarations, for example—statements made by a person on his deathbed, knowing that he was about to die—were deemed admissible on the premise that “no man would meet his Maker with a lie upon his lips.” Statements against the speaker’s interest—for example, a confession to an act of wrongdoing, or the acknowledgment of a debt—were generally regarded as an exception, because it was understood that only a desire to tell the truth would account for a human being’s open presentation of a statement that could not advance, but only harm, her interests. Written business records, if kept and maintained in a regular and reliable fashion, were deemed admissible despite their hearsay nature: this exception rested on a recognition that the exigencies of business would require a merchant or banker to keep accurate records or fail. Startled utterances describing some exciting or alarming event that had just happened were admitted on account of the excited state of the declarant and the immediacy of the outburst, for these circumstances were thought to provide some warranty against prevarication. The lawyers for the three insurance companies appear to have been blindsided by the Hillmon attorneys’ belated invocation of the hearsay rule during the third trial. No doubt they ran through the various exceptions to the hearsay rule in their minds, desperately seeking to recall and invoke one that would suit Frederick Adolph Walters’s letter to Alvina Kasten. With little time to reflect on the matter, they argued that the letter was a business record. But this was desperate indeed, for the letter resembled no business record that the court had ever seen, and so Judge Shiras rejected this suggestion and ruled that the letter, undeniably hearsay, was subject to no recognized exception to the hearsay rule and was thus inadmissible. Between the jury’s verdict against them in 1888 and the argument of their case before the Supreme Court in 1892, the insurance companies’ lawyers had a great deal more leisure to perfect their advocacy for the admissibility of the letter. They were impressive lawyers, but regarding the letter they could formulate no proposal any better than the one the trial judge had already rejected: in their appellate briefs they argued again that it was a business record. The Supreme Court was plainly eager to rule for the insurance companies, and began its opinion by declaring that Judge Shiras had not allowed the defendants to remove a sufficient number of prospective jurors without cause. The opinion could have stopped there and sent the case back to be retried on the basis of that error, but Justice Horace Gray, writing for the Court, seemed bent on addressing the question of the Walters–Kasten letter. He and his brethren could not, however, endorse the proposition that the letter was a business record. Nor did any of the other generally recognized hearsay exceptions seem to fit Frederick Adolph Walters’s correspondence with his betrothed. Nevertheless, the insurance companies won their argument about the letter: the Court simply invented a new piece of law in order to make it admissible and thus to thwart Sallie Hillmon’s efforts to claim the insurance proceeds. But it was not the custom of the United States Supreme Court in that century (nor is it now) to acknowledge that it makes the law to suit the facts, or its view of them. Justice Gray’s language and logic in the Hillmon decision are designed to persuade the reader that the Court is discovering, not creating, a legal rule. Accordingly, the opinion does not announce that a new rule is being devised to make a cigarmaker’s love letter admissible in evidence. Instead it pronounces that there is a well-recognized exception to the hearsay rule for out-of-court statements that describe the intentions of the declarant. Since the Walters letter described young Frederick Adolph’s intention to travel west with a man named Hillmon, it was, the Court said, admissible, and Judge Shiras had erred in keeping it from the jury. I have come to believe that the Justices (having seen the famous love letter) were certain that John Hillmon had murdered Frederick Adolph Walters to perpetrate insurance fraud, and was probably hiding out somewhere until the proceeds were paid. They could not bring themselves to let Hillmon get away with this crime, as he would if his wife were to succeed in obtaining the life insurance proceeds. The only way to prevent this outcome was to ensure that the jury in a new trial saw the letter. But the letter was undeniably hearsay, and hearsay was not admissible unless it conformed to some exception to the hearsay rule. No generally recognized hearsay exception made the letter admissible. There was but one inexorable solution to this puzzle: the Court must invent a new exception to the hearsay rule, one that would by its terms apply to Frederick Adolph Walters’s letter to his fiancée. And that is precisely what the Court proceeded to do. The case was not over with the Court’s decision, of course; it was sent back to be retried. Later events and circumstances prolonged it for more than another decade, and cast both more light and more shadow on the truth of what happened at Crooked Creek in 1897. It was 1903 before the Hillmon case was finally settled. The evidence about the identity of the body at Crooked Creek, developed in the course of six separate trials, was by no means all on one side. The famous letter from the cigarmaker to his sweetheart was joined by other strong evidence that the corpse was not Hillmon’s; but it was also opposed by some convincing evidence, offered by Sallie Hillmon’s lawyers, that the body indeed belonged to her husband. Suppose, as I have argued, the Supreme Court did invent the Hillmon rule to make the outcome of the case as they understood it—that is, as one of murder and fraud—a proper one. Wouldn’t some inquiry into whether they got the facts right be useful in arriving at history’s judgment of the Court’s work? What might such an investigation disclose? And might twenty-first-century science and technology allow us to arrive at a more confident judgment about the corpse’s identity than nineteenth-century forensics would permit? These questions are taken up in the pages that follow.